berries | A City girl gone Country. 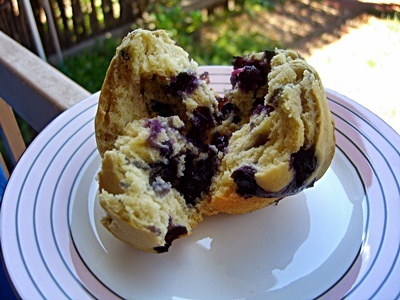 Some blueberries left over from a blueberry smoothie about a month ago (regular readers may remember my post on it – Mmmmmm smoothie) featured in my muffin mix today, and gosh they were good. And to think that I was worried I hadn’t put enough blueberries in. 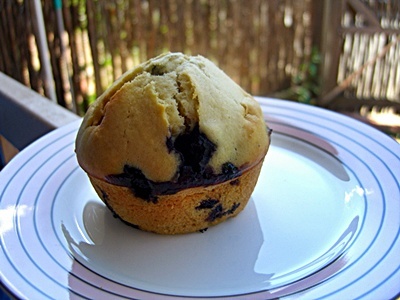 My first muffin was more blueberry than muffins I think! This is my basic muffin recipe that I made the banana muffins out of. I noticed that I needed to add a splash more milk to counter not having the mashed up banana included in the wet ingredients. However, I think they worked super well, and the only way they could have been better, would have been with a sprinkling of raw sugar on the top of the muffins before they went into the oven, to add a bit of crunch on the top. Mix dry ingredients in bowl. Beat egg + add milk & melted butter, then pour wet mix into bowl. Stir mixture together until just combined. Add in blueberries and fold. Spoon into 4 big muffin cups, and bake for 25 minutes in a 200C oven. Great quick Sunday morning breakfast 🙂 In fact, I made the mix before I put the laundry on, they baked whilst the machine was working, and I munched on down after my laundry was done. Fantastic!